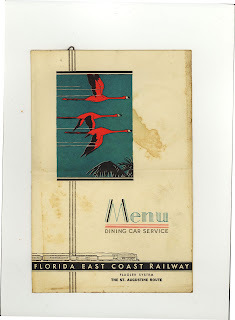 The second page of the menu had a small insert attached with a rusted paper clip. It gave more dinner options. The third page is actually the second page without the small insert. There you will see what beverages could be purchased. 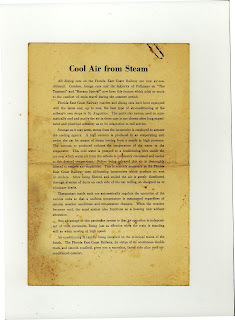 Finally, the back cover had an explanation of how the train was cooled and heated through the use of steam - perhaps something to read while you were waiting for your food. 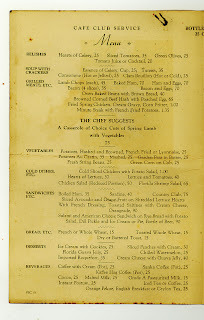 I vote for the Southern Spring Chicken Fried in Butter with Cream Gravy and Corn Fritter, New Potatoes Hashed and Browned and Lima Beans in Butter. Butter.....mmmmmmm (I dislike margarine, which I thought was invented during rationing in WWII - this is pre WWII - BUT I was wrong). Aha!! Apollinaris is billed as the Queen of Table Waters. That still doesn't tell me what sarsaparilla tastes like.....according to the article I attached to the word, "sarsaparilla", it takes like a more birchy root beer and Target is now bottling a naturally and artificially flavored sarsaparilla drink which I'll have to purchase just to taste it. 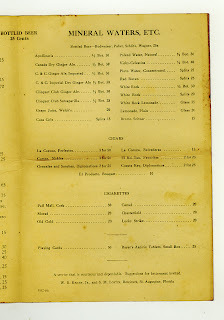 Since I now know what each beverage is, I vote for the sarsaparilla. There's only one thing that bothers me about this idyllic look at railway travel in 1935. Ever the realist, I know that my black friends would not have been passengers on this train with me - they would have been the porters and waiters. While that was a good and honorable job, there clearly was an uncrossable line between servers and passengers. 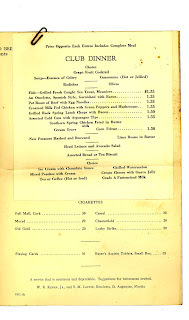 I don't know about you, but I'm going to enjoy my dinner here in 1935 and leave a big tip for my server. I can't change history, but I can do a little bit to show appreciation to those who make my trip so comfortable. Hey! This is a great site! !